Hey do my Scandinavian friends!! and all others… Yes I know this is a little bit of an unusual preparation, not the traditional Swedish way!! But it is worth to try, though, so light, as the tender leaks, simmering slowly in a curry sauce, will bring a different touch of exotic flavor to a simply oven baked in foil healthy salmon fillets. Preheat the oven to 350°F. Placing the rack in the center. In a small sauce pan bring to simmer the vegetable broth. In a medium skillet add olive oil, then the leaks and slowly cook them till half done, about 10 minutes now add 2 or 3 ladles of vegetable broth, covering leaks with liquid. Simmer for 1 more minute. Add curried cream to the leaks, stir well, reduce heat to low and cover, (follow up, it should be a liquid sauce, if necessary add some more broth and adjust curry, salt and pepper. In oven lay 2 aluminium foil pieces, (it should be big enough to envelop each filet closely), place fillet in the center, add few thin slices of butter, salt and pepper, and close loosely and bake for about 10 minutes. Remove the oven dish, open enough to be able to pour some of the leaks sauce around each fish fillet, close and bake for about 15 to 20 minutes. 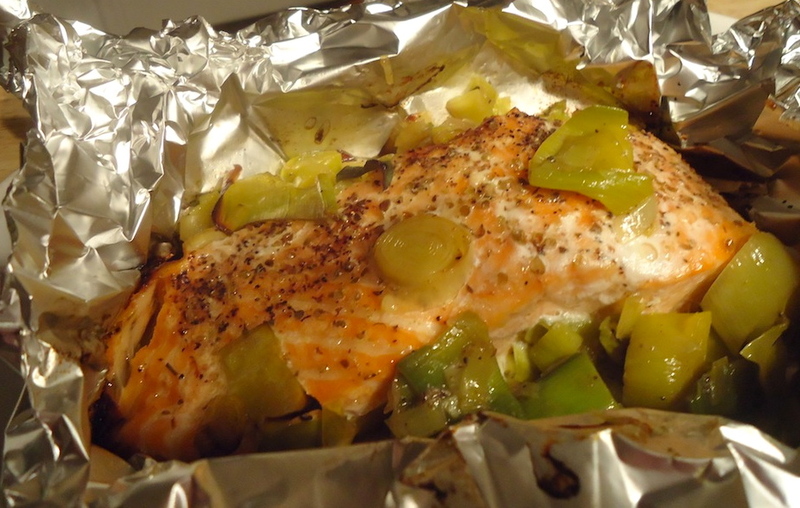 The salmon is done when nice colored and flaky but still firm to the fork. Sprinkle with lemon juice and serve with boiled potatoes, or rice! I like your recipe too, simple and tasty!